Reese's Peanut Butter Cups in a DULCE DE LECHE (slow cooked condensed milk) gelato, topped with caramel popcorn and home-made peanut butter chocolate topping sauce, this flavour brings together all your favourite childhood flavours in an amazing cup. Your favourite breakfast spread made into luscious creamy gelato, and topped with a white chocolate ganache syringe, pralinated hazelnuts and your very own mini floating NUTELLA jar to take home! Can you say decadent? Chunky apples churned with luscious milk gelato, served in a cone with house-made warm apple chunks, velvety cream and lightly dusted with cinnamon sugar. You won’t find this deconstructed APPLE PIE in Nan’s kitchen, especially when she doesn’t have the secret recipe to our home cooked chunky apple sauce. This one's for the big kids only. We like GUINNESS. We like CHOCOLATE. Putting them together in a gelato was a no-brainer. 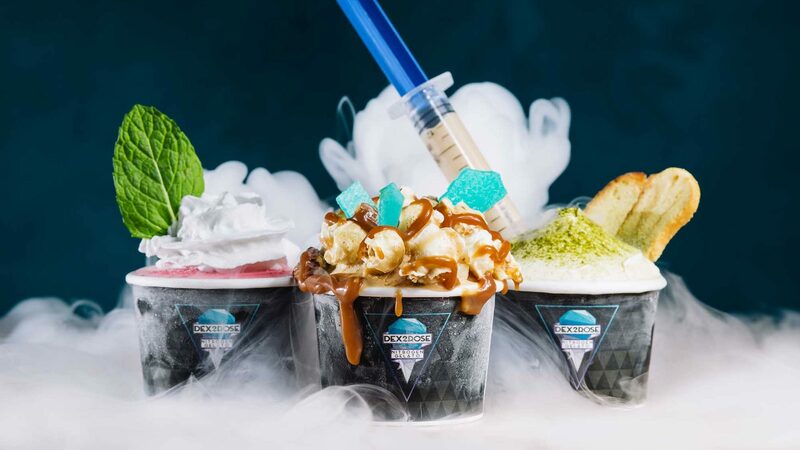 Topped with mini crunchy pretzels, a home-made salted caramel syringe, and more salted caramel sauce, you can now have your drink AND your dessert. At the same time. Boom. To celebrate all things unicorn, we came up with this ROASTED STRAWBERRIES and BUTTERMILK gelato. The sugar in the strawberries caramelise due to the roasting process, and better brings out its flavour. Presented with colourful lollies to complete the transformation, this gelato looks as magical as it tastes! We've taken the classic BIRTHDAY CAKE and made it into a creamy, buttery gelato, and added chunky home-made double chocolate cookie dough for a special treat that'll be sure to remind you of your special day! This classic sorbet has been reimagined with a warming twist, featuring extra virgin OLIVE OIL and SWEET PAPRIKA, to add that extra dimension to the tangy and tartness of the LEMON sorbet.Topped with sweet paprika and a strawberry sauce syringe. This beautiful POACHED RHUBARB and GRANNY SMITH sorbet is perfect for winter and is paired beautifully with a white chocolate gelato. If you ask us, it's comforting and brilliantly perfect for the cold weather. Omit the white chocolate gelato for a vegan and dairy free option. Crispy on the outside, fluffy and moist on the inside, and laced with dark chocolate chips, our Belgian waffles are the stuff dreams are made of. Topped with fresh seasonal berries, rainbow meringues, Persian fairy floss, a dollop of gelato and edible blooms, these babies are blackened with edible charcoal for those drool-inducing Insta-worthy shots. Served with a pouring ganache. Our crepe cakes are made from layers upon layers of velvety paper thin crepes interlined with luscious fresh cream. Served with gelato, drizzle sauce and crumble. Choice of flavours: salted caramel, matcha and milk tea. Best enjoyed neat over ice, but feel free to add milk and/ or sugar syrup to your own taste. Featuring our own lightly spiced hot chocolate, this decadent set comes with a generous dollop of salted caramel gelato, raspberry drupelets, and toast-at-your-table home-made marshmallows. Just enter your address and find Dex2rose.